Once known for his quirky and sprawling, ensemble based Robert Altman-influenced dramas, writer/director Paul Thomas Anderson has gone over to the dark side of pretentious, arthouse films that dare to challenge audiences. And that’s fine. It shows an artist maturing as he grows into himself, but I can no longer really count myself as a fan. His latest work “Phantom Thread” is expertly crafted; nothing in the frame seems to be out of place as it’s impeccably staged, but it’s emotionally hollow and offers very little in the way of a rewarding experience. Even Jonny Greenwood’s score feels like an artist going beyond what made him so enjoyable in the first place. 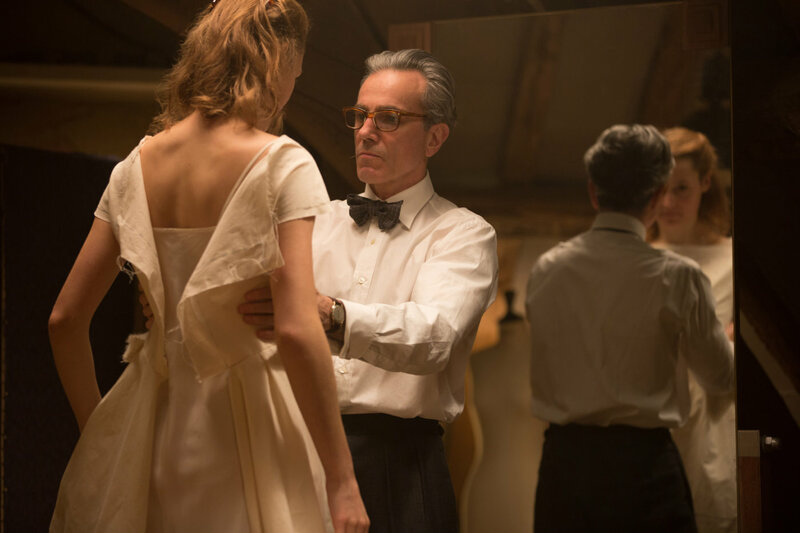 “Phantom Thread” is a bizarre love-hate story about annoying people and how they learn to deal with each other. I’m not sure how we’re supposed to care about them, but even if the film is a little slow and stodgy it at least offers bright bursts of humor to help us stay awake. Set in lavish 1950s London, Daniel Day-Lewis, allegedly in his last film role before he calls it quits in the film industry, “Phantom Thread” follows renowned dressmaker Reynolds Woodcock (Day-Lewis) who has a very lavish and rigid life. He lives with his sister Cyril (Leslie Manville) who keeps his life orderly and consistent. She's easily the most interesting character in the film. He woos a sweet waitress named Alma (Vicky Krieps) who eventually moves into his flat with him. Cyril immediately considers this a terrible idea since Reynolds has never had successful relationships because of his controlling personality. What comes next is a sort of battle of wits between the pair as Cyril looks on. Alma butters her toast too loudly and it pretty much ruins Reynolds day. He’s THAT sort of person. So basically what you have here is one of the most ridiculously lavish romantic comedies every put to screen. And you’ll either love it or find it dreadfully pretentious. I sort of fall into the latter category. I find much to appreciate in the films’ artistry. The performances are fine, but the characters are hart nuts to crack. I found myself rooting for Cyril who is really just the awkward third party. While Anderson has been influenced by Robert Altman in the past, he seems now to be influenced by the melodramas of the 1950s and 60s. The film has a sort of Hitchcockian feel to it. Shots of eyes through peepholes and themes of obsession were not lost on me. In the end the film leaves you feeling hollow. Though that was probably the intent.